GERMANY: German wind turbine maker Fuhrländer is to co-operate with Wind to Energy (W2E) on a new 2.5 MW machine. The two small firms are to install a prototype in the summer in the eastern state of Mecklenburg-Vorpommern. On a 160 metre lattice tower, with blade tips reaching 205 metres, it will be the tallest turbine in the world, says W2E. "The turbine has a new compact drive train concept and installation is made simple thanks to a special crane, for which a patent has been applied for," says the company's Christoph Klewitz. The design is a blueprint for a variable-speed, pitch-controlled turbine family with rated capacities of 2.3 MW, 2.5 MW and 2.7 MW for low, medium or high wind speeds. The concept will be certified for concrete, steel, and lattice towers. The ex-Nordex engineers who founded W2E have worked on the design since December 2002. W2E was founded in Rerik, on the Baltic Sea coast, in May and numbers seven engineers. Lattice tower builder Seeba Energiesysteme of Stemwede owns nearly 25% of W2E and financed its development over the initial months of activity. 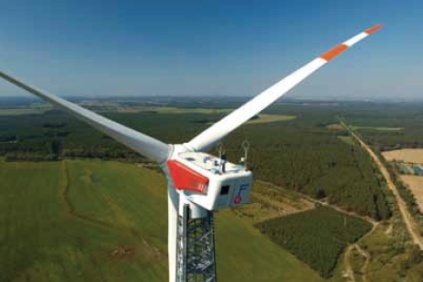 Fuhrländer is the first to secure a licence to produce the W2E turbine. It will contribute development know-how, including trainee programs for other licensees, and be involved in negotiations with other potential licensees worldwide, says Klewitz. As a small company, with turnover in 2002 of EUR 47 million, the co-operation is a way for Fuhrländer to be able to produce ever larger and more advanced turbines.